Transformation of native habitat by human activity is the main cause of global biodiversity loss. Humans have visibly transformed 27% of Alberta to date. The effects of these changes depend on the species, and the nature and extent of the human activities in question. Teasing apart these factors in a cumulative effects framework are of the focus of several initiatives and organizations in Alberta. The Alberta Biodiversity Monitoring Institute (ABMI) collects data and produces information that helps attributing the effects of human activities on species to different industrial sectors, or as we call them, sector effects. 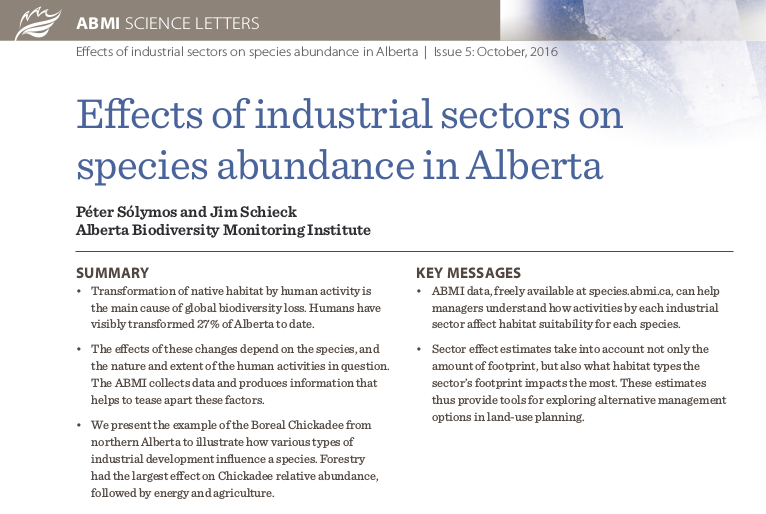 The latest issue of the ABMI Science Letters, Effects of Industrial Sectors on Species Abundance in Alberta, presents sector effect estimates take into account not only the amount of footprint, but also what habitat types the sector’s footprint impacts the most. These estimates thus provide tools for exploring alternative management options in land-use planning. The document shows the example of the Boreal Chickadee from northern Alberta to illustrate how various types of industrial development influence a species. Forestry had the largest effect on Chickadee relative abundance, followed by energy and agriculture. Information on other species are freely available at species.abmi.ca, can help managers understand how activities by each industrial sector affect habitat suitability for many species.